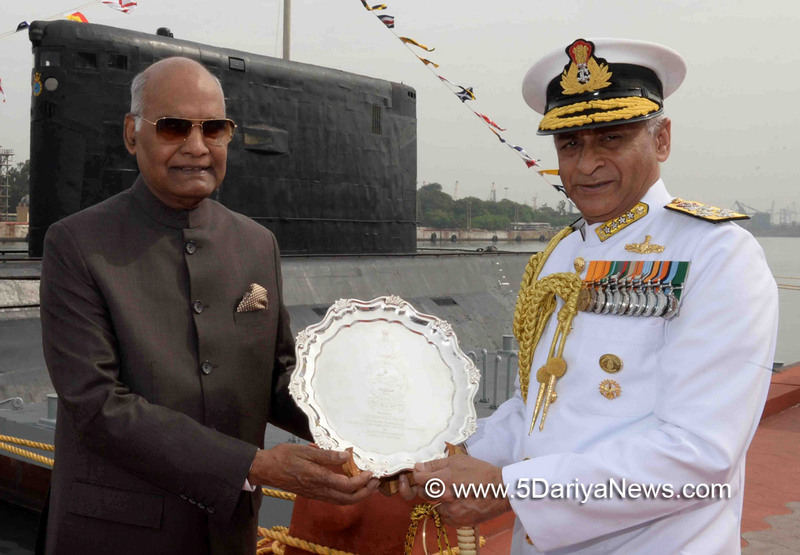 The Hon’ble President of India and the Supreme Commander of Indian Armed Forces, Shri Ram Nath Kovind awarded the President’s Colour to the Submarine Arm of the Indian Navy today, 08 December 2017. The date of 8th December 2017 will remain etched in the history of the Submarine arm in golden letters as the award of Presidents Colour is the highest honour which can be bestowed upon any military unit. The President’s Colour was received by Rear Adm Veenam Srinivas Flag Officer Submarines on behalf of the Submarine Arm at a splendid ceremony at Eastern Naval Command, Visakhapatnam.Shri ESL Narasimhan, Hon’ble Governor of Andhra Pradesh and Telangana, Shri N Chadrababu Naidu, Hon’ble Chief Minister of Andhra Pradesh, Shri Ashok Gajapathi Raju, Union Minister of Aviation, Adm Sunil Lanba PVSM, AVSM, ADC, Chief of the Naval Staff and Vice Adm Karambir Singh Flag Officer Commanding-in-Chief Eastern Naval Command along with other senior Defence and Civilian dignitaries were present on the occasion. Speaking on the occasion, Shri Ram Nath Kovind Hon’ble President of India congratulated the Submarine Arm of the Indian Navy and said that the valiant submarines of the Indian Navy carry out their professional responsibility with great skill and grave risk and that the nation is proud of the achievement and appreciates the contribution to national security (full transcript of the address by the Hon’ble President during the Colour Presentation is attached). The commissioning of the first Submarine, INS Kalvari on 08 Dec 1967 laid the foundation of the Submarine Arm. 2017, the Golden Jubilee year is being celebrated as the “Year of the Submarine” by the Indian Navy. The submarine arm has been at the forefront of all offensive operations of the Indian Navy and played a particularly stellar role in the 1971 Indo Pak war. During the 1971 war four submarines were actively deployed on both the Eastern and Western Maritime theatres of operations in the Bay of Bengal and the Arabian Sea. Their presence achieved the desired deterrent effect and restricted the enemy operation at sea to a considerable extent. Personnel of Submarine Arm were awarded one Maha Vir Chakra, two Vir Chakras, one Shaurya Chakra and a number of Mention–in–Dispatches for acts of bravery during the war. The Indian Navy has rich experience of operating six classes of submarines which includes conventional and nuclear submarines. Indian Navy by way of its Maritime Strategy has adopted a strategy of Deterrence to maintain peace. Submarines singularly form the most important pillar of this strategy.The Indian Navy was first of the three Services to be presented the President’s Colour on 27 May 1951. And today this honour was bestowed on the Submarine Arm in recognition of the yeoman service rendered both in peace and at war.